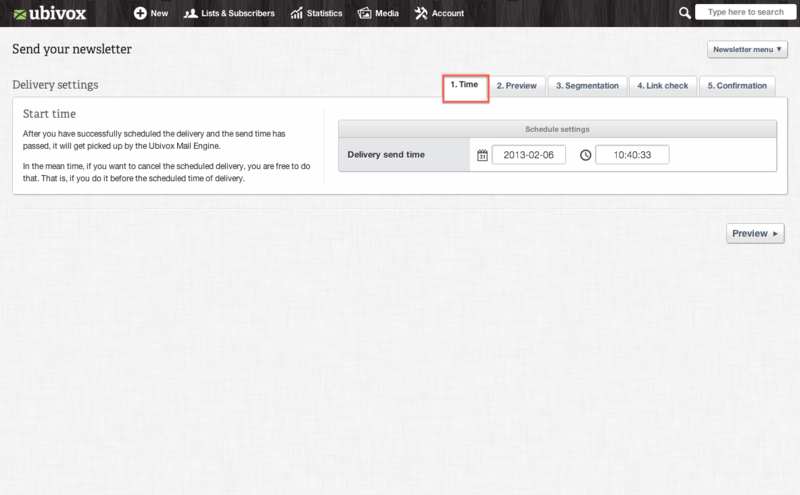 Ubivox enables you to schedule the delivery time of your newsletter. 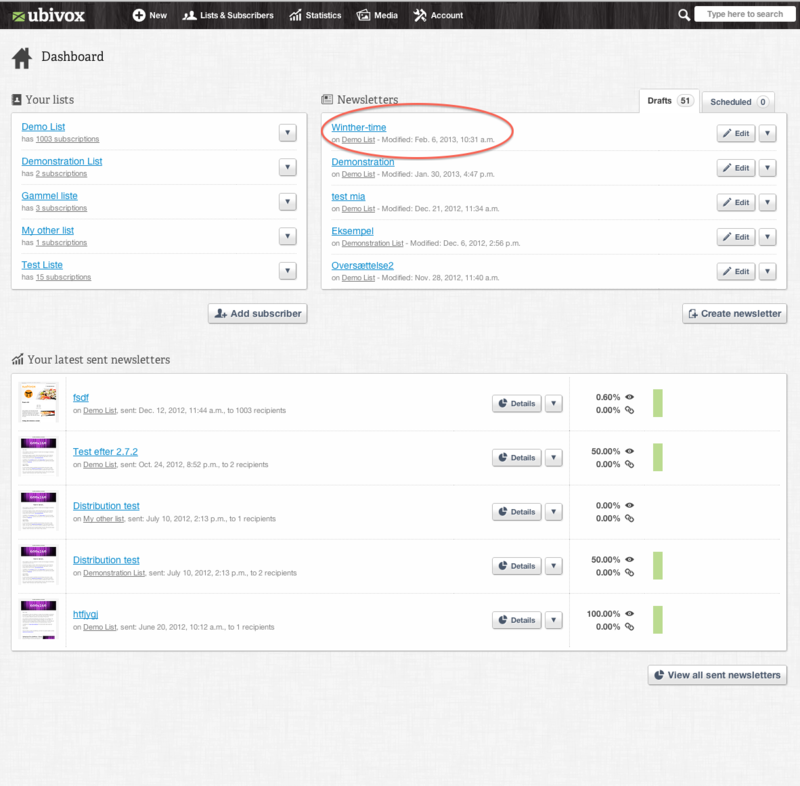 This is a feature in the system that enables you to, strategically; reach your target group more efficiently, i.e. sending the newsletter in the evening etc. Once you are done editing the newsletter you have to follow 5 steps before your newsletter is ready to be send, which are the following: Time, Preview, Segmentation, Link check, Confirmation. However, you can already plan the time of your mailing in the editor.This is done in the top right corner at -->'Schedule delivery'. In the below guide we will show you how the 5 steps are conducted in practice. 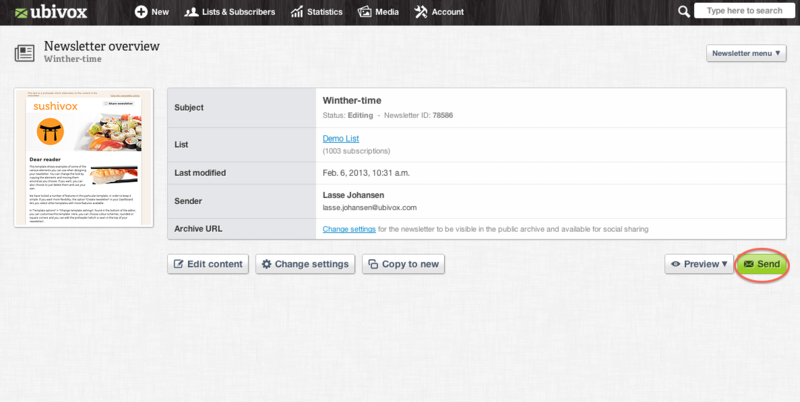 1) At the Dashboard chose the newsletter you wish to send. 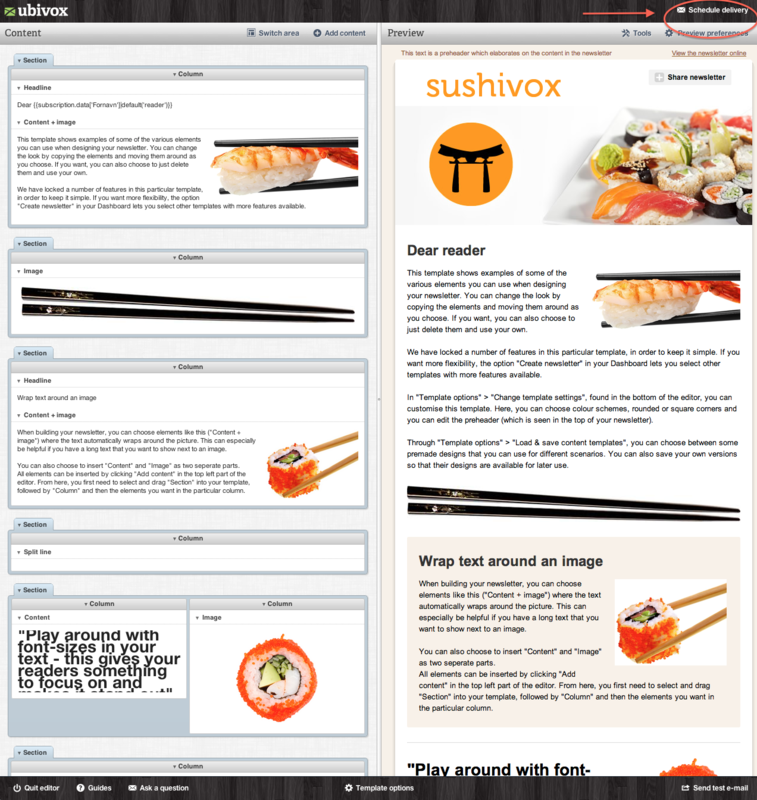 2) You are now directed to the Newsletter overview. At this page, chose Send. 3) Hereafter you state the Delivery send time of the newsletter. We recommend that you add 15 minutes to the time you chose, as it is convenient to have a little extra time if a last minute change has to be made. 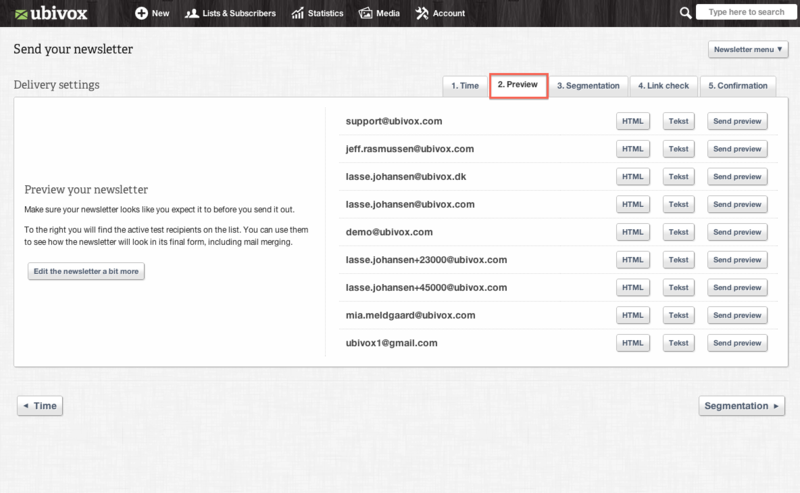 4) You may now chose to send a preview of the newsletter to a test-recipient. This may be done in order to receive feedback from others in your organization/company before the newsletter is launched. 5) At the next step, 'Segmentation', you are able to see if there is an active 'Segmentation rule set'. If so, you are able to edit it as well. 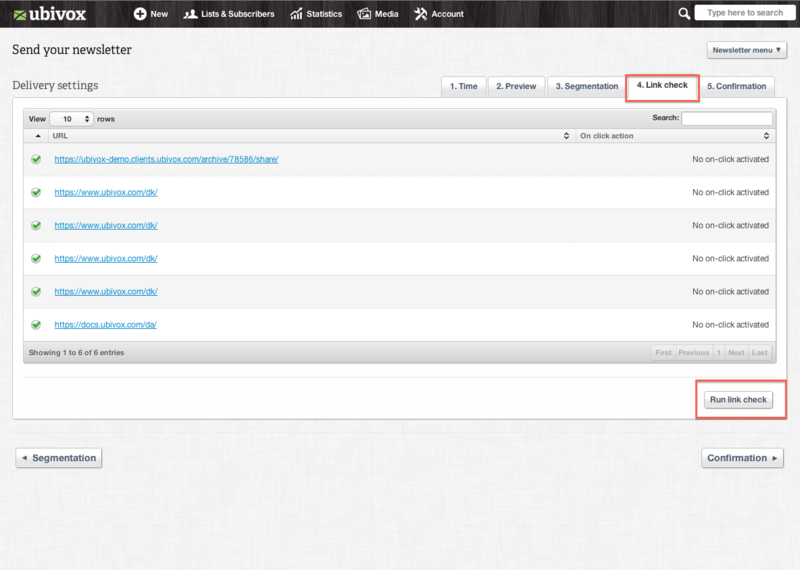 6) After Segmentation it is time to Run link check. The Link check is guiding and may show red fields, however if one press the link and it works actively, it will also work in the newsletter. 8) A green girder will appear which states the newsletter has been send. Please notice the possibility of canceling.